Art Deco Weekend, the annual celebration of all things deco in the home of America's largest deco architecture preserve, kicked off last night with the traditional vintage car parade along Ocean Drive, Miami Beach. Cruising is a big thing on Ocean Drive, so much so that some nights the "No Cruising Signs" flash and cars are forbidden. But on this night everyone came out, and the weather, which had been chilly and threatening rain, cooperated. 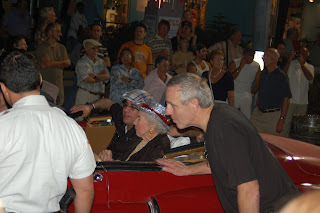 Doris Eaton Travis, 104, and the last surviving Zeigfeld Girl, sat in the first car, a Cadillac, of course, as The Parade Marshal. Cars of all vintages, many from the South Florida Car Club took part and bringing up the rear were the hunks from the Miami Beach Fire Department. Vendors set up on Ocean as well and sadly very few of them had anything either vintage or deco. In years past there was quite a bit but what I think is generally reflective of the antique business as a whole, folks just ain't buying' it.